Balances (transaction free) service – useful for a fresh start or really messy legacy data. Please check this link for a balances (transaction free) service or see below for a full transactional history service. If you do not want any transactions at all, for example it is a very messy file, then you could consider a balances service which are transaction-free. Most times we can convert at least current plus the previous financial year of history. there are errors or a large number of transactions in the file. You will see on the conversion service selection page how much history you can receive under the basic Xero sponsored service and any options to purchase additional history. You choose the history start date, and you receive all transactions from that sate to wherever the data ends in MYOB. No matter how many transactions your accounting file has, it all gets converted in the same reliable manner. With full line item details and all payments against them. A full and accurate history within Xero means there is no need to go back to the source file to look anything up. All invoices, statements and Credit Notes can be created and emailed from within Xero exactly as they were in your old software. Every invoice includes invoice date, invoice number and reference (PO Number). Every single invoice-line is transferred, including lines with description only. Item invoices use the correct item codes and quantities. Any original invoice that is entered including tax, will arrive in Xero in the same way. Quotes and Orders are entered as Draft Invoices and Bills, purchase orders are brought across as purchase orders in Xero. Note that Quotes prior to your selected conversion history start date will not be converted. Also note that due to field and system differences between accounting packages, when Orders are converted to Draft Invoices in Xero the PO Number cannot currently be extracted so you will not see PO Numbers in Draft Invoices. During the conversion we cannot allocate ‘Billable expenses’ against Clients in Xero. As a result this information needs to be updated post conversion. Note with invoice numbers, due to the data mapping process you will lose any zeroes at the start of the invoice number e.g. invoice number 0001285 will appear as 1285 in Xero. 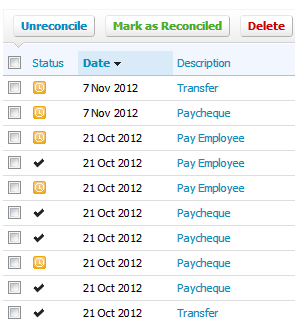 Recurring invoices will need to be set up in Xero following conversion. 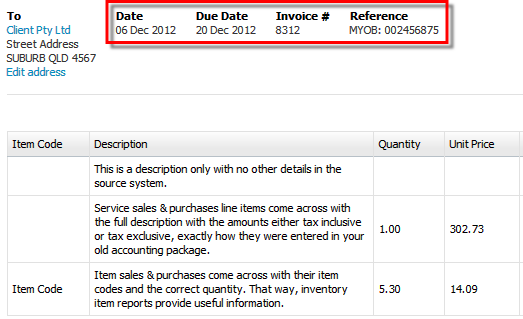 With MYOB conversions you also receive invoice due date. ABNs will be converted for contacts. Our software can only import sales services orders/quotes not items sales orders/quotes. For MYOB conversions Quotes & Orders in the items sales format will not be converted. During the conversion we cannot allocate Billable expenses against Clients in Xero. As a result this information needs to be updated post conversion. Every payment is transferred and booked against each invoice. That means you can see exactly when payments were made against all invoices when clients need to talk to debtors. This also includes Credit Notes that are assigned to another invoice to pay it off. 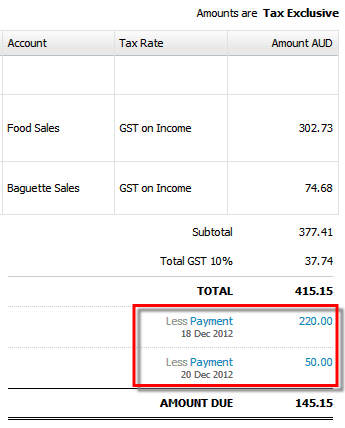 Full details (as in invoices) with one additional line representing any assignment to another invoice or refund. Each Credit Note is accurately assigned to the invoice/bill on the day that it is assigned in the source file. Any overpayments are handled accurately through Credit Notes. So when you enter the next invoice for a client who has paid a deposit, a credit note will automatically remind you of it. Reconciled according to the source file. All bank transaction details are transferred with reconciliation exactly matching what is already reconciled in MYOB or Reckon. So in this example, starting the bank feeds from 1 November will pick up the unpresented cheques from before and automatically pre-match them during the normal bank reconciliation process. This means that all the work done is preserved in Xero and the client can continue where they finished off in the old accounting system. Exactly as the accountant intended. All manual journals (general journal) details come across exactly as they are entered in the source file with the correct accounts and GST settings. Xero does not allow bank accounts to be used in Manual Journals and Invoices, so they are replaced by a “Transfer Account” and an additional Spend Money or Receive Money transaction is created. 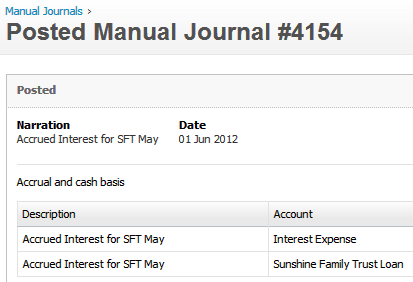 Xero also does not allow any journal entries to Trade Creditors and Debtors to keep the integrity of the data intact. Any Invoices or Bills that have been paid off via manual journals in the source file will need to be reviewed post conversion in Xero. You may need to apply payments against open Invoices/Bills if they had previously been paid in your source file. The balance in the Account Receivable/Payable Original account can be used to offset the open Invoices/Bills imported post conversion in Xero. If there has been excessive use of journals against system account in the source file we may not be able to complete the conversion with transactional history.